Toy Story Mania is definitely our favorite ride in Disney's California Adventure. In fact, this trip it was the only ride we went on in this park. You go in the regular line until you get to the boarding area. The cast member here will then direct you to go straight ahead to the wheelchair boarding area. They have a wheelchair accessible vehicle here that is off the regular ride track, so the ride continues to operate normally until the vehicle is loaded and added to the regular ride track. They load all physical disabilities and sometimes other GAC groups in this vehicle. This means that the wait time after you get through the normal queue can be awhile, although since we have been going in the off season the past few times we have not noticed that much of a delay. The first summer it was open, though, we would wait another 30 plus minutes after the regular queue. Totally worth it for this ride, though. The take a seat out of the vehicle for the wheelchair to fit. The person riding next to the wheelchair has to go in first and sits to the left of the wheelchair. 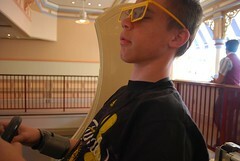 The cast member (or another person in the group) then rolls in the wheelchair if the user cannot roll themselves in. They use a seat belt around the passenger instead of a lap bar coming down. 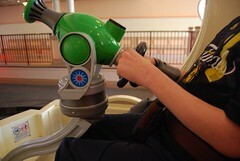 They then lower the blaster and make sure it is at a comfortable height for the wheelchair user. The blaster for the wheelchair spot is for the most part like everyone else's. It has a string to pull to shoot, but it also has an alternative method of shooting. This alternative is a button on top. This is easier to use than the string pull method. Mik prefers the string method for most of the game, but he uses the button to quickly rack up points at the last bonus part where you are hitting the single non-moving target as much as you can before time runs out. 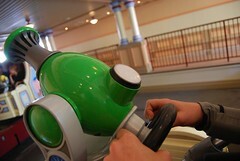 Note that the ride vehicles quickly rotate between the games. Mik's upper body control is good when he wants it to be, but he still often ends up flopping to the side on this because the movement happens so quickly and it is hard to prepare for it due to the ride often stopping for extra time at the games when the loading process gets backed up and then suddenly moving you to the next game with little warning. At least once Mik has said he wished he had a chest strap like on his first chair just for this ride and he totally hated that strap!